That honestly doesn't look like anything to me. 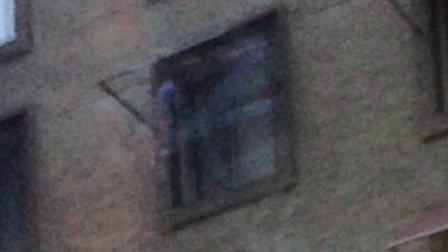 I see a blurry window. It looks like a dark-haired man with black glasses, standing to the left of the blue blur. I don't know how to tell if it's real or not, but reading the article sure puts a chill up your spine -- so many people have come to such tragic ends there. Enlarge the photo 100-200%, there's no figure, face, just blue mass. No doubt Ramirez hangs around for the negativity energy. Our brains are hard wired to find human faces and figures in a noisy background. For our ancestors, identifying an enemy lurking in a dense forest was a valuable survival skill. Try googling "pareidolia pictures". I clearly see the ghost of Bugsy Sieagel, he appears to be wearing plus fours and a Dodgers baseball hat co ck-eyed.